This is an introduction along with images of the LID Control and data require3ments in InfoSWMM. Every InfoSWMM Control uses from one to 5 layers of data – each with different data requirements. You can use the Siting Manger of InfoSWMM Sustain to find LID locations and the LID Optimizer to find the optimized number of units, cost of units, area and thickness of the LID layers based on your runoff and water quality control objectives. 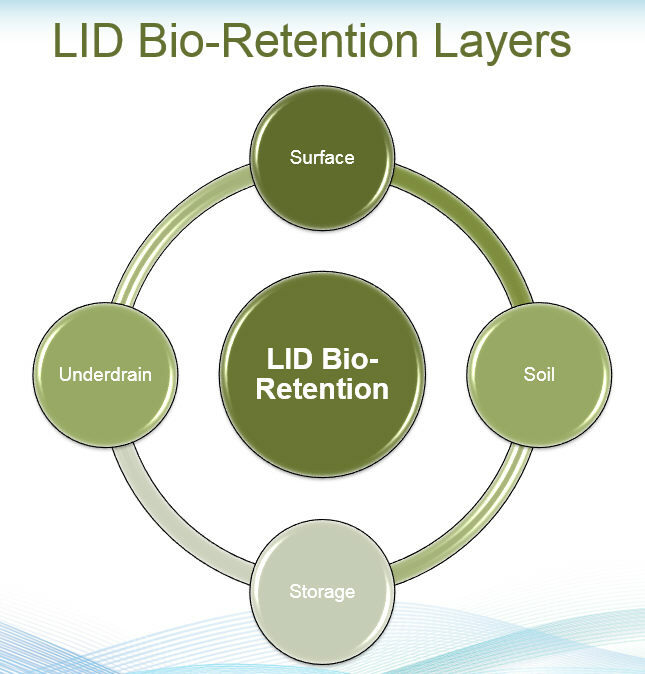 The Bio-Retention LID Control has four components or Process Layers: Surface, Soil, Storage and Underdrain. An example of a Bio-Retention Cell. The four layers used in a simulation for a Bio-Retention Cell LID are shown in the following image.